I almost never went to Muscat. 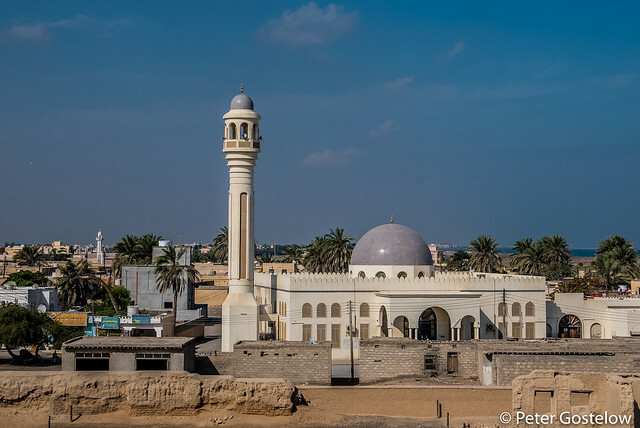 Oman’s capital, which had at one time been the end point to this tour, lost some of its appeal once I arrived in the town of Ibri and took a much needed break. I was now much closer to the UAE and Abu Dhabi, where my brother had recently moved. This seemed a more fitting place to finish a tour. Unless I were to fly out or take a boat to Iran, this really would be the end of the road. But I had some remaining weeks left on my Omani visa. 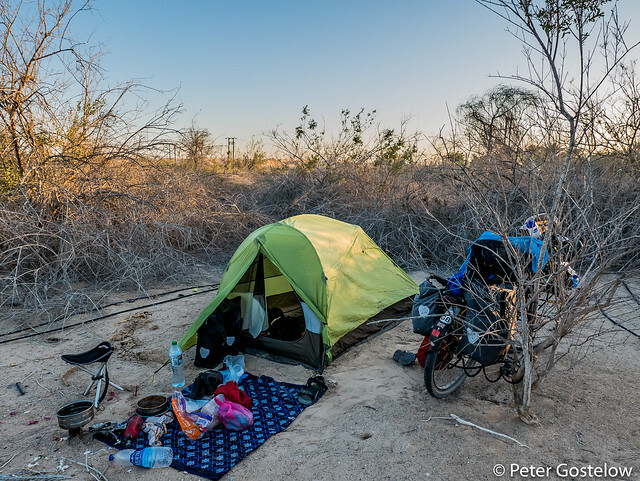 Leaving the country on a highway to the UAE and Abu Dhabi, when there were more mountains, wadis and desert camping to explore in one of my favourite cycle touring destinations, seemed like a poor plan. 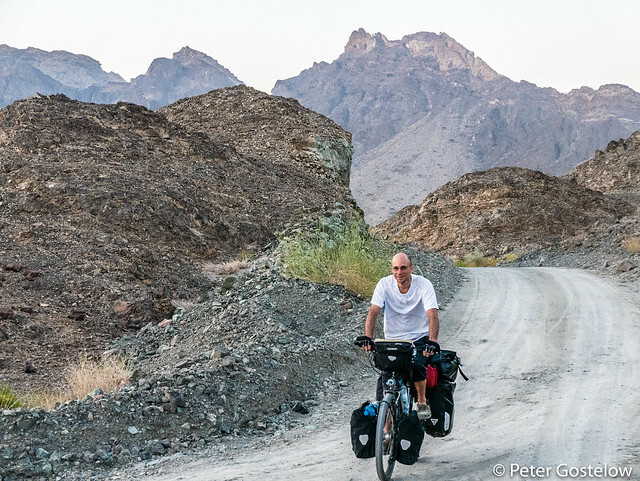 And so off I went towards Muscat, before turning round and finding the quietest possible route into the UAE. 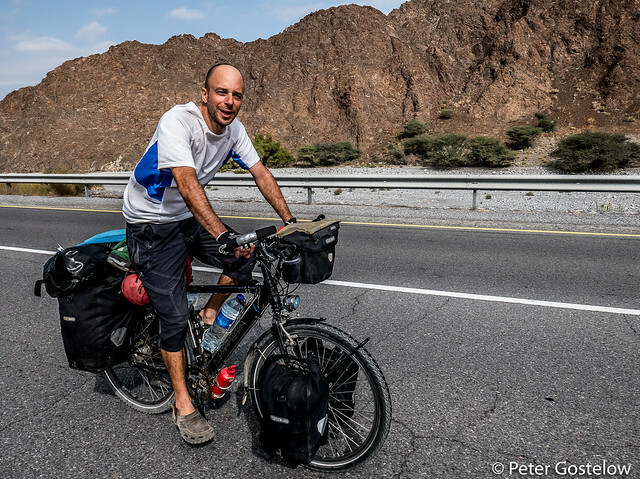 I left Ibri with Daniel, aka Dosh, who was cycling from the UK-India. At least that was his plan when he set off some 6 months previously. He had recently been in the UAE and Iran. 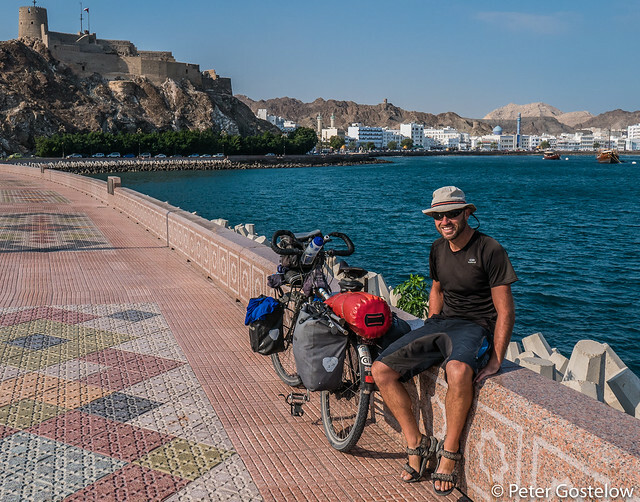 His route plans for Oman were vague so on the morning of departure we decided to ride to Muscat together. His blog is here. 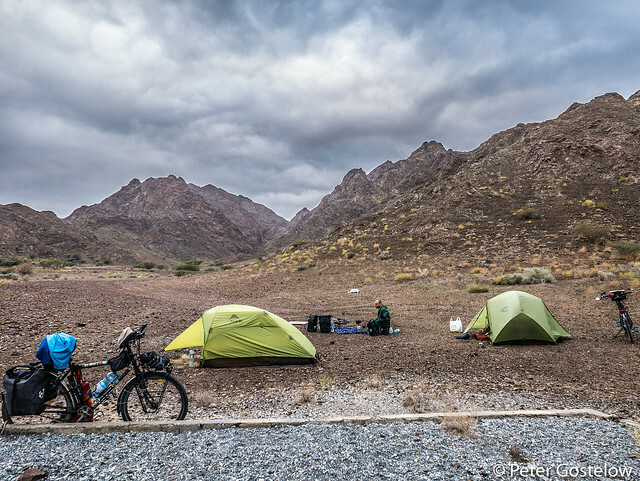 Our first night on the road took us back into the Hajar Mountains. The moon was almost full. I put the camera on my tripod and opened the shutter for about 1 minute. 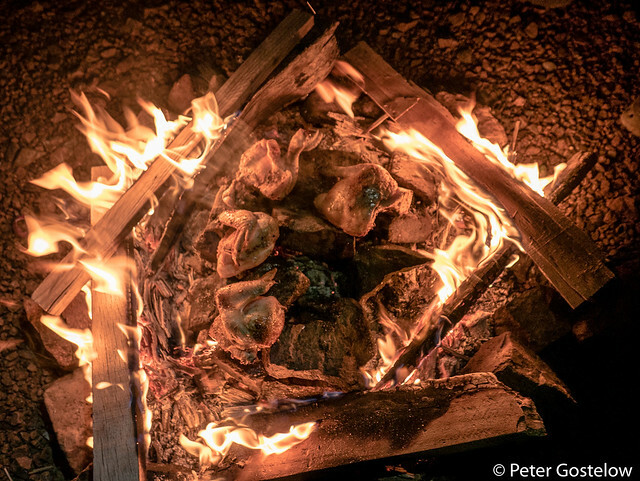 I used to fear lighting fires when camping, but in Oman it’s perfectly safe. Wood is also surprisingly easy to find in many places. 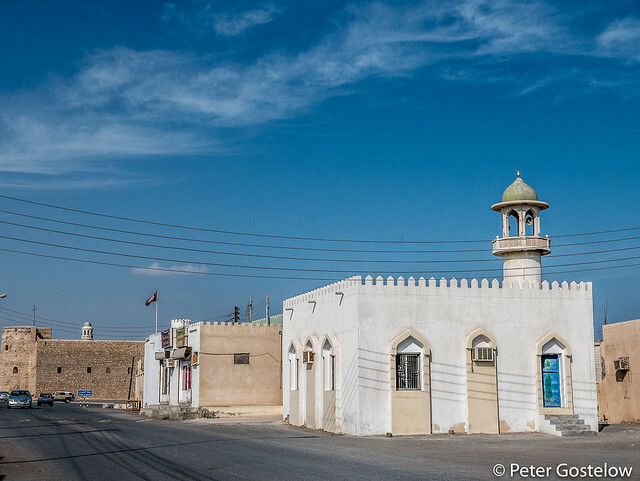 We cycled through the town of Rustaq on our second day, which like many old Omani towns, has a fort worth stopping to see. 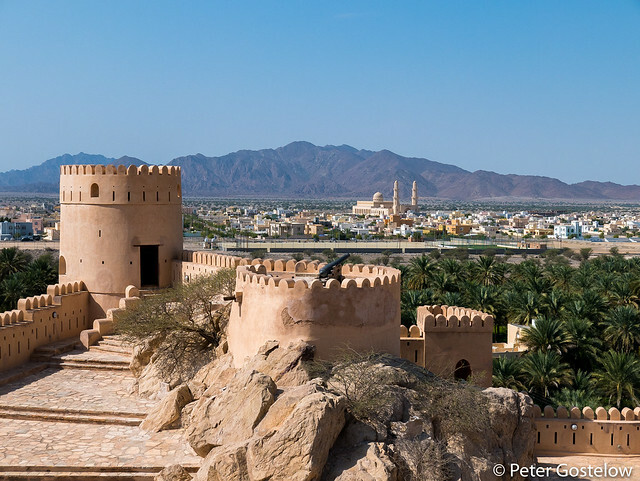 Over the past few decades many forts in Oman have been restored, at huge cost. Rustaq’s fort, like most of the ones I visited, charges a very modest £1 entrance fee. 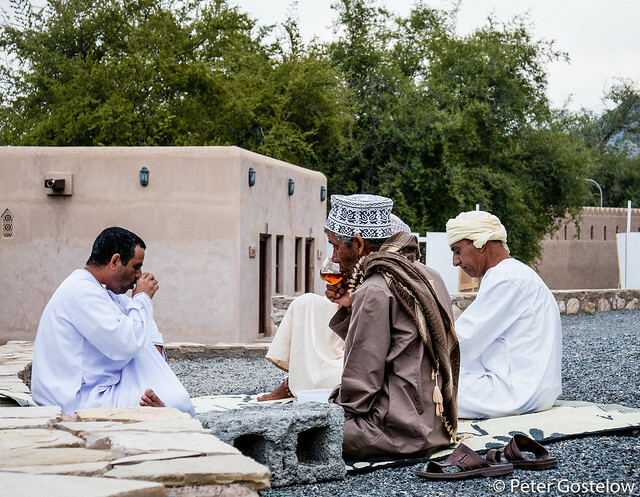 Tea drinking outside Rustaq Fort. 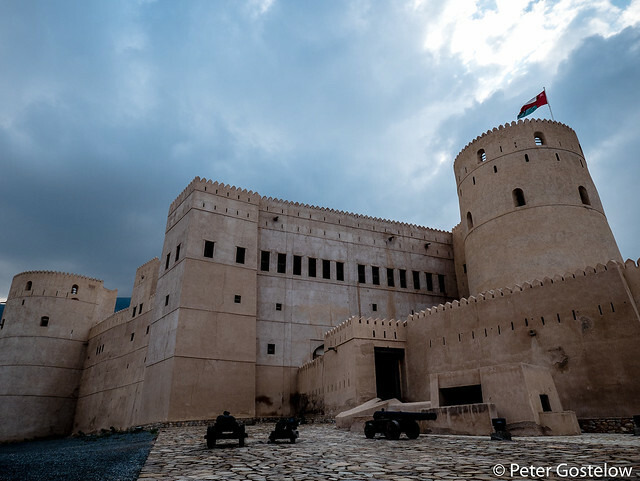 The only inconvenience with most of these forts in Oman is that they close at around 4pm. 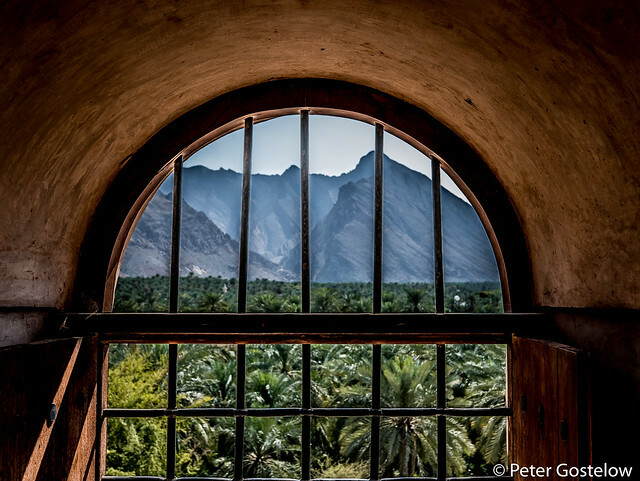 The view from Rustaq fort. 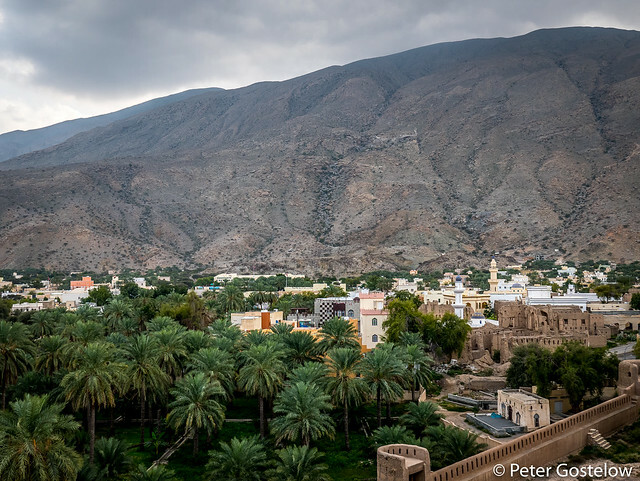 Despite there being so little rainfall in Oman there are parts of the country, which thanks to an ancient system of aqueducts, keeps areas like this fertile year round. 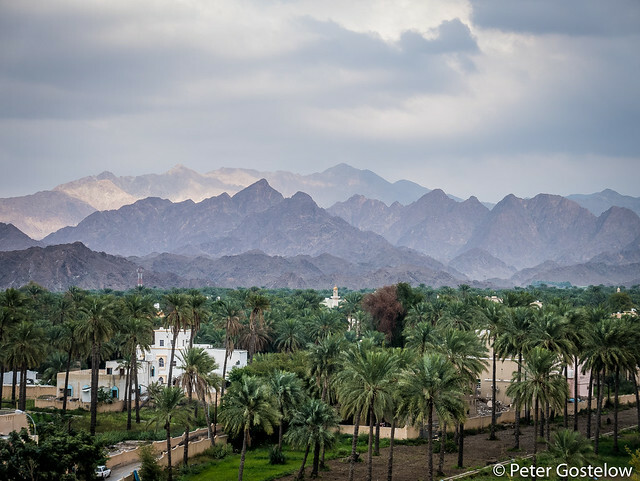 Rustaq sits at the base of the Hajar mountains. 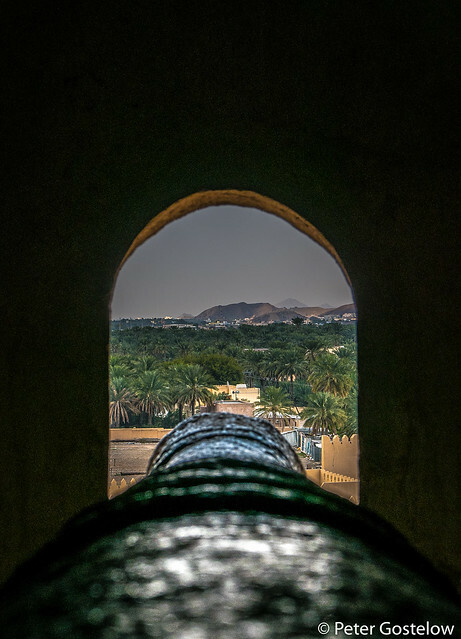 One of many canons within Rustaq fort. 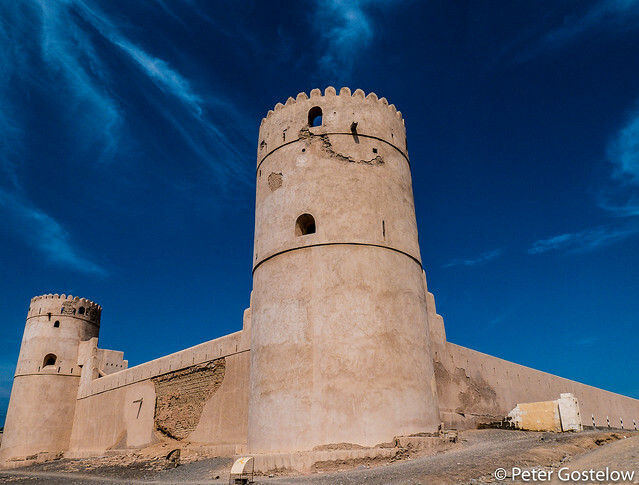 From Rustaq we continued to Nakhal, which also boasts a fairly impressive fort. 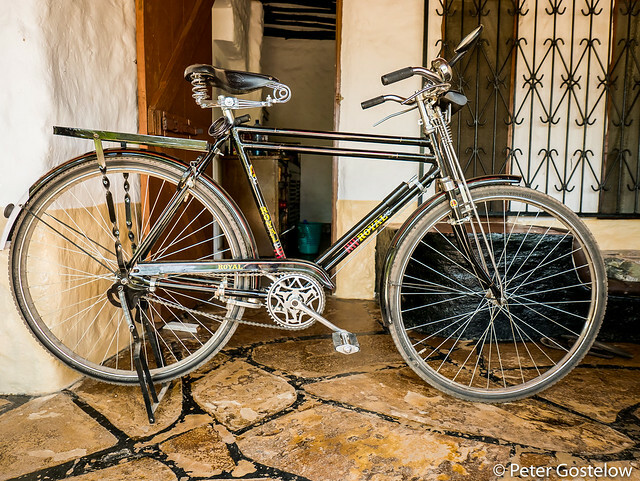 Dosh was riding a Koga World Traveller, a popular Dutch-made touring bicycle. We chatted a lot about gear, as is usually the case when meeting another tourer. Our tents are both manufactured by the same company – MSR. The Hubba Hubba, which Dosh was using, is the tent I used before while touring in Africa. My replacement, the MSR Nook, beats it on weight and compactness, but I do prefer the extra floor space in the Hubba Hubba and fact that is has two vestibules and entrances. Without the flysheet the Hubba Hubba is also a better star-gazing tent. I may go back to this in the future. Grilling chicken on hot stones. We failed to find a fresh chicken so I bungeed a frozen chicken onto my front rack for half the day. This wasn’t long enough to defrost it, but we managed to cook it quite well in the end. 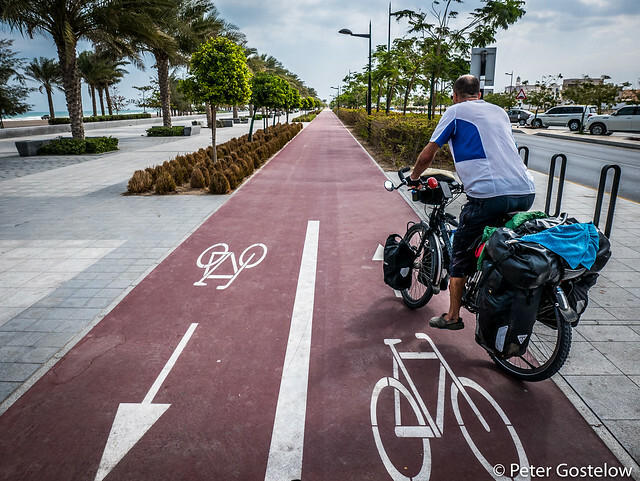 The ride into Muscat included a surprising stretch of cycle lane as we went along the coast at Seeb. This only lasted about 5km. Mutrah, the old quarter of Muscat, is where we headed to in the capital. This could have been the end of my journey had I decided to finish here. Looking back over the years I don’t think I’ve ever come towards the end of a tour and been happy to finish. Other than the jubilation of reaching a goal, life off the road soon makes me restless. It was just as well as I was tagging on another 600km or so to ride to Abu Dhabi. There can’t be many public parks in capital cities around the World where camping is safe. 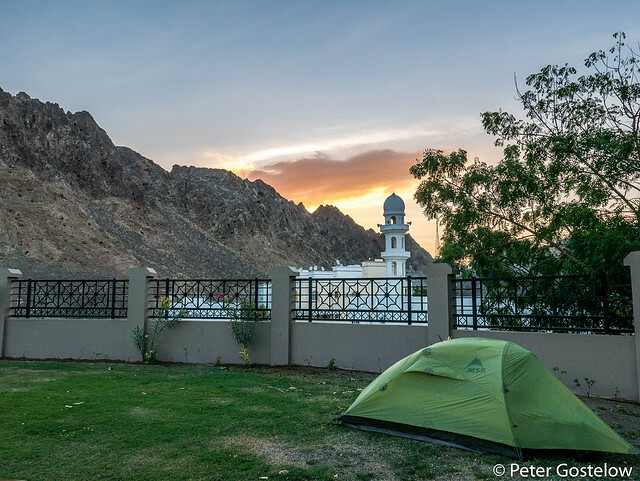 This one in Mutrah did in fact close over night as the gates were locked at 11pm – probably a good thing. I expected a visit from the Police at this time or whoever was closing the park, but we were left in peace until the muezzin in the mosque pictured here, woke us at 5am. I said goodbye to Dosh in Muscat and headed north along the coast. Fortunately parts of the highway were not completely finished. For some stretches I was able to cycle on a 6 lane highway to myself. 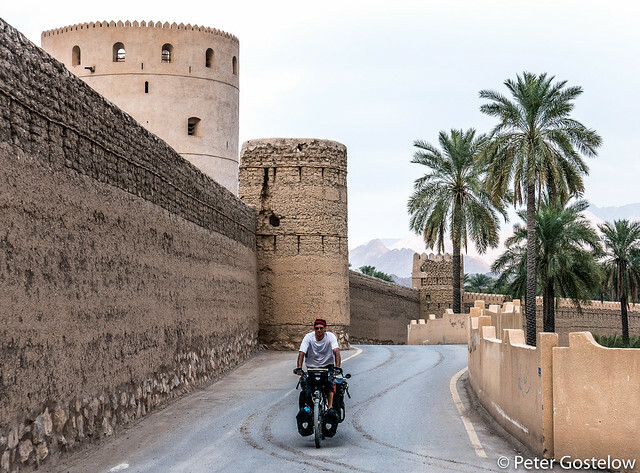 The Batinah coastline, which stretches north from Muscat to the country’s third largest city of Sohar, provided plenty of minor roads passing through small towns and coastal villages. The view from one of the coastal forts in Al Batinah. Outside of which I was invited for coffee and dates with this friendly duo. 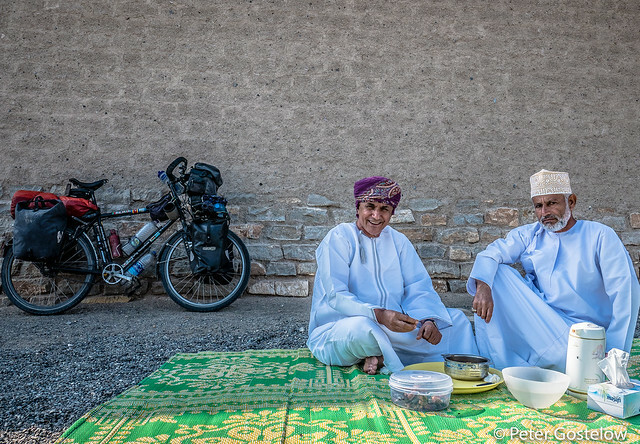 Omani men take great pride in their appearance. No wonder there are so many barber and tailoring shops in every town. 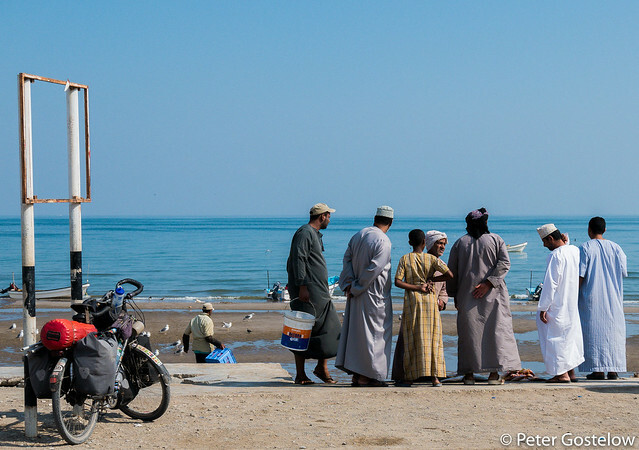 As for Omani women – well during my entire stay in the country I recall speaking with one. 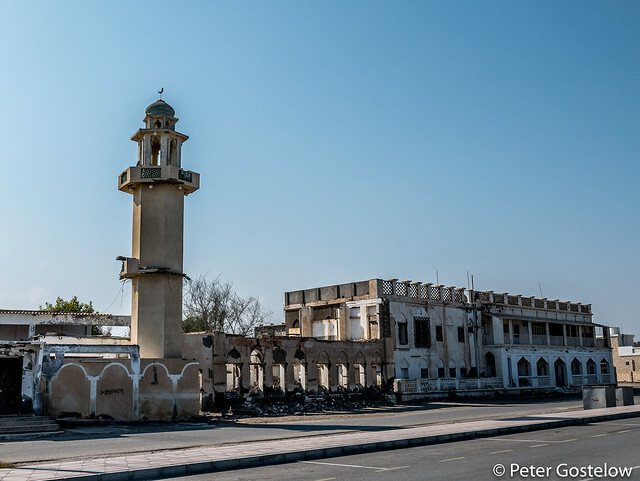 Not everything about Oman was great….. The fort in Al Suwayq was closed when I passed, but impressive enough from the outside to appreciate. Most of the coast here is populated with fishing communities, who could probably learn something about protecting their environment. So much rubbish is washed up and thrown on the beaches here. 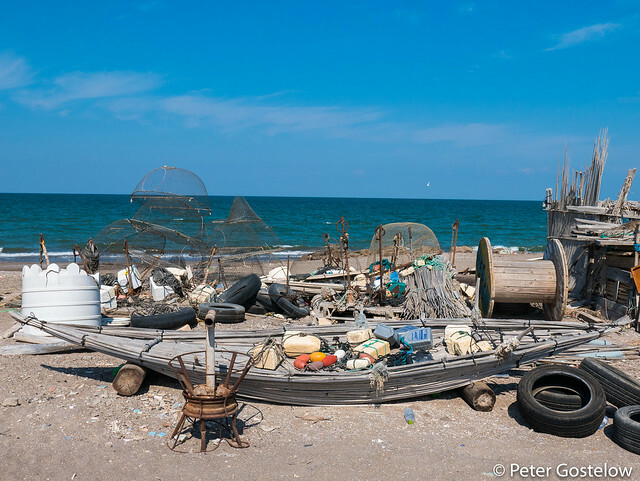 Fishing apparatus along the Al Batinah coastline, including a tradtional shasha reed boat. In the small coastal village of Aluwaydat I met Ahmed, who worked in one of Muscat’s big hotels. He had come home for several days of leave and invited me to stay with him. This involved a tour around the grounds of his family’s property, where they kept several large bulls. ‘This one is a champion fighter’, boasted Ahmed as he grabbed the nostrils of an enormous beast. 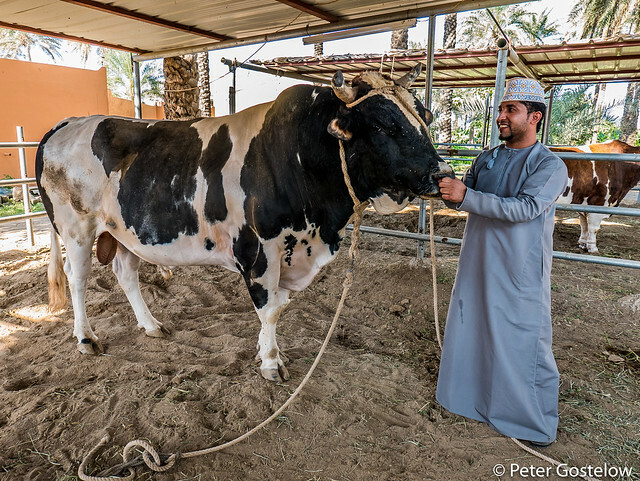 I didn’t know until I researched it later that the Al Batinah province has a long history of bull-fighting. Unlike the Spanish style of bull fighting, here the animals fight each other – mostly locking horns and using their strength to move or scare the other bull away. My first and only night out in Oman was with Ahmed. 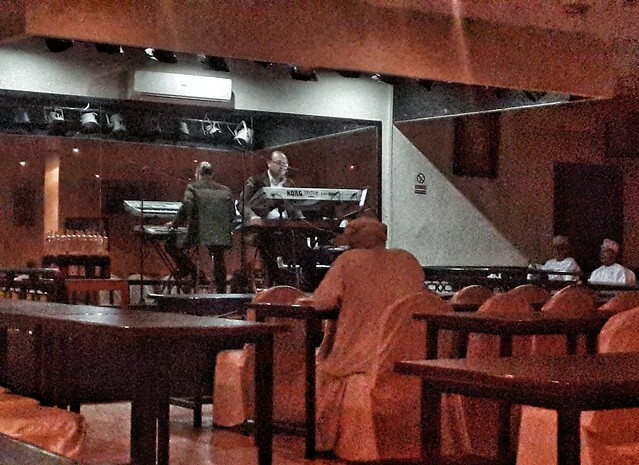 This was less of a night out than him driving me 30km to the nearest bar where we sat in an almost empty hall listening to an Egyptian singer playing popular Arabic hits. 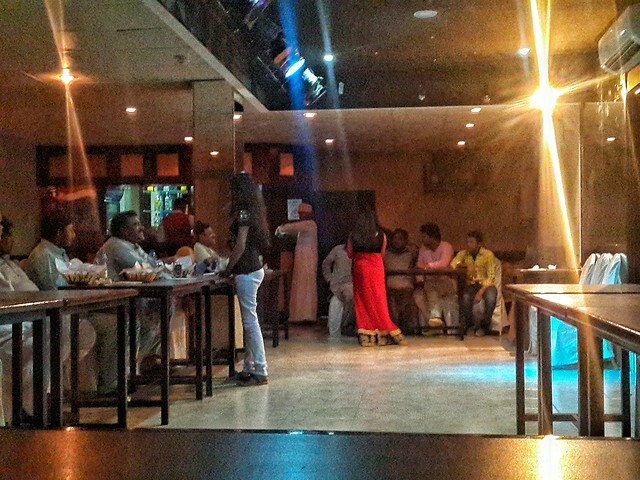 The other dozen or so clientele were all Omani men, sheepishly sipping beer. I practically downed my first one having not had a drink in over 2 months. Alcohol is not forbidden in Oman, but not easy or particularly cheap to obtain. In another smaller room within this bar/hotel establishment were more men – Pakistani mostly, as well as several women – Indian Ahmed had said. The latter spent most of the time sitting on chairs facing the tables of men, occasionally walking over to exchange greetings and probably numbers. It was a pretty depressing sight. Oman definitely isn’t a country to travel to for a drinking and dating experience. I continued the next morning along the coast, slightly heavy-headed, which is when the fish markets are most active. Several days previously while camping with Dosh for the last time we had tried to buy fish from a market in the small coastal town of Barka, but had arrived too late in the day. 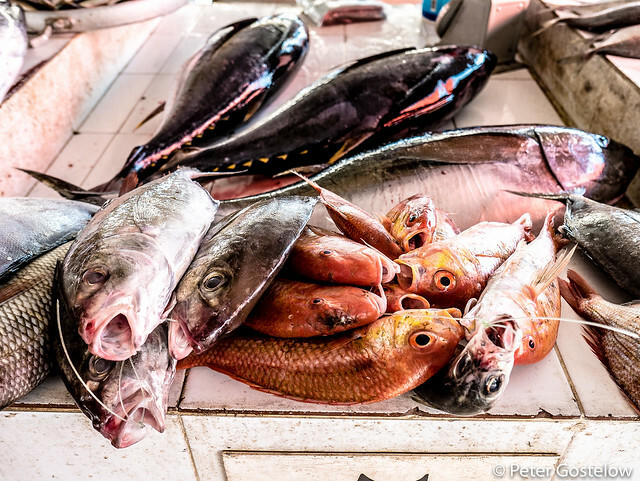 Not far away was a hypermarket, where I expected the price of fish to be far more than the cost from a local market. Whether that was the case or not, we bought over 1kg of fresh barracuda (2 fish) for £3. We ended up steaming these in tin foil on the beach later that night. One of the best meals I have had while camping. 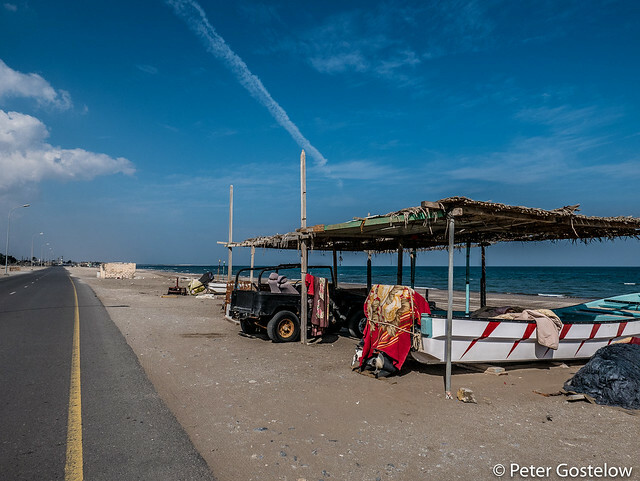 A lot of the houses and buildings along the Al Batinah coastline are slowly being abandoned. It was Ahmed who told me of the government’s plans to build another highway alongside resorts and other housing here. Traditional fishing communities who once lived here are now offered money to build new homes some 500 metres or so from the beach front. 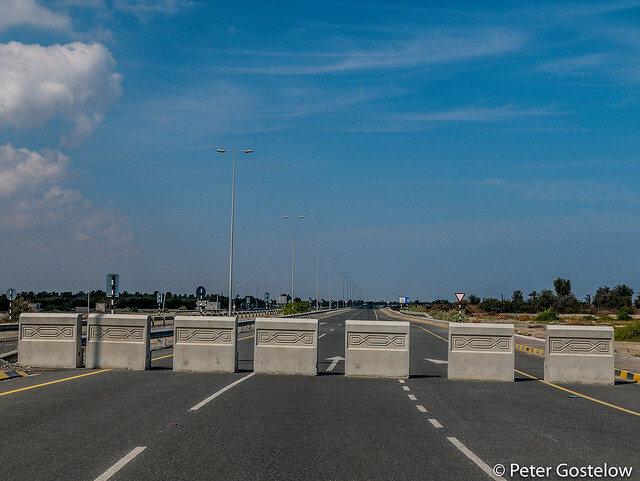 The result is almost 200km of neglected and ruinous infrastructure. 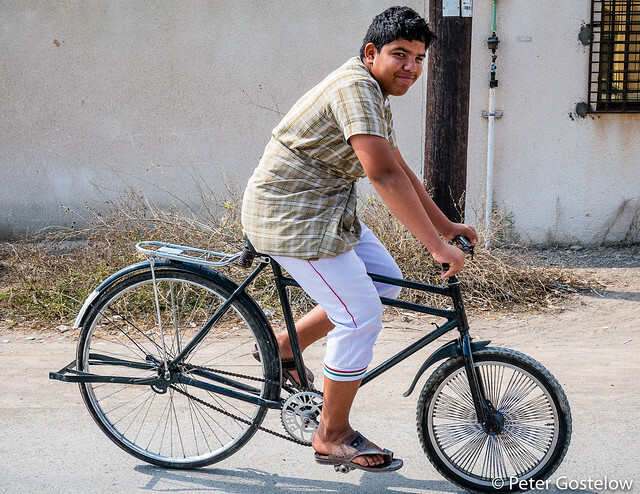 Omani teenager in one of the Al Batinah coastal villages. Turns out this is great for letting the back wheel slide out when turning a corner. I saw a number of other bicycles in Oman put together like this. Morning view from my tent. Blissful. 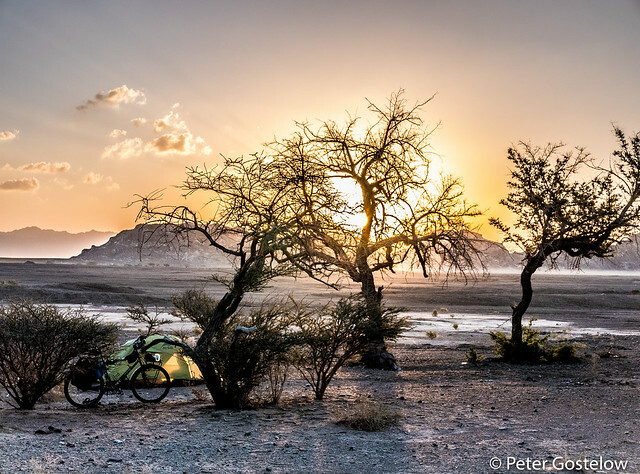 My last camping spot in Oman turned out to be as memorable and scenic as many of the other 40 odd places I pitched my tent in the country. There wasn’t enough wood here to make a fire, but the surrounding mountains, silence, night skies and beautiful sunrise were a fitting finale to a country I will probably remember best for its quality and ease of places to camp. 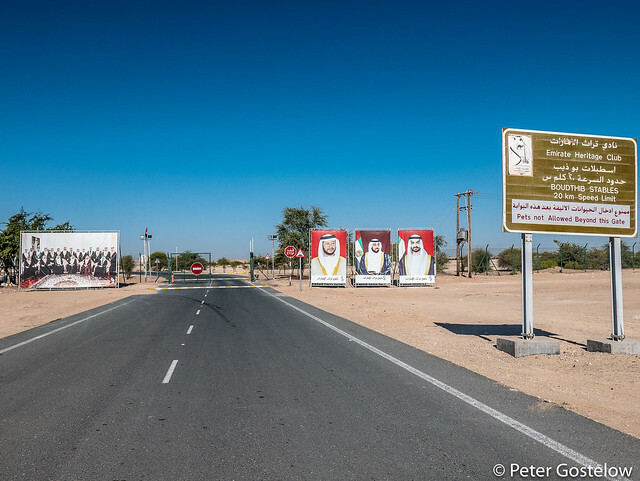 A lot of sand dunes as I crossed into the UAE, although getting to them was impossible as most of the roadside was fenced off – probably a good thing. 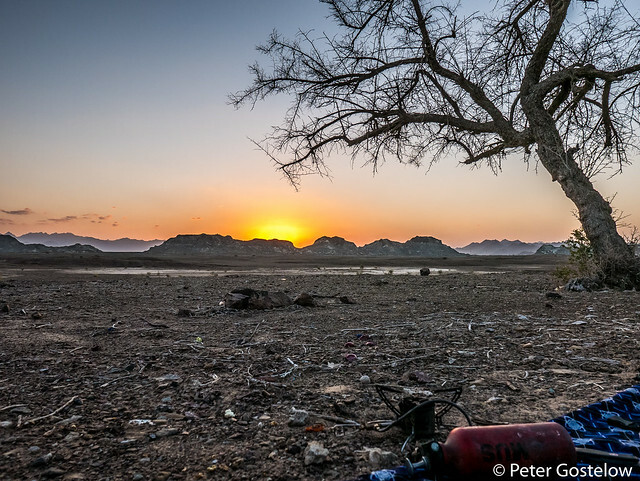 I was disheartened at how much rubbish is thrown into the desert by careless people in Oman. My only night camping in the UAE was within some semi-dead vegetation. Roadsides are entirely tree-lined and irrigated in this country. They are also almost all entirely fenced off, which makes camping away from the road somewhat challenging. Fortunately I had spotted a break in the fence nearby here and ducked in to hide myself as the sun began to set, kicking away broken irrigation pipes to pitch the tent. 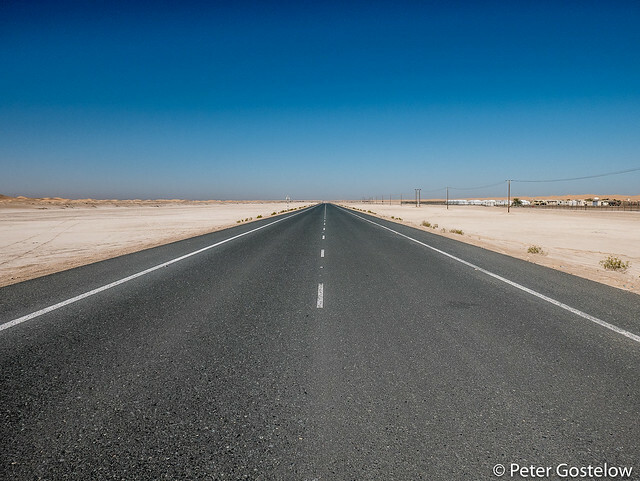 In order to avoid the 10-lane highway that connects the Omani border with Abu Dhabi I managed to cycle on almost empty minor roads that run parallel to it. Most of these connect strips of irrigated farmland, worked on by teams of Bangladeshis, as well as some private estates. I expected to be turned back when I rolled up to the gate pictured here, but the smiling Ghanian security guard waved me through. Most of these side roads were only visible when zooming in close to google maps or using maps.me, a phone app I’ve increasingly relied upon for this tour. 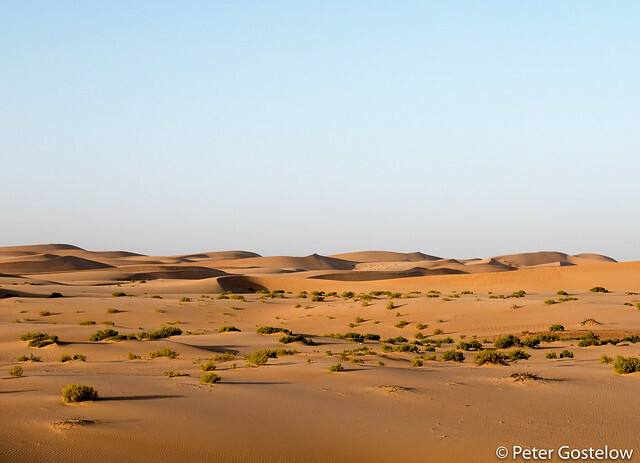 This picture was taken about 60km from Abu Dhabi. Some 5km later I hit a highway full of trucks. I knew then the tour, for all of its enjoyment, was over. My brother had said to call him when I got close to Abu Dhabi so he could come and pick me up. With the wind at my back and adrenaline running high alongside traffic moving at 160km/hr+ I ended up riding right into Abu Dhabi, at which point traffic lights and pavements came to my rescue. Not a ride that I would wish to do again. I locked the bicycle outside a mall and disappeared to find a wifi connection, paying £4 for a cappuccino while my brother came to meet me. 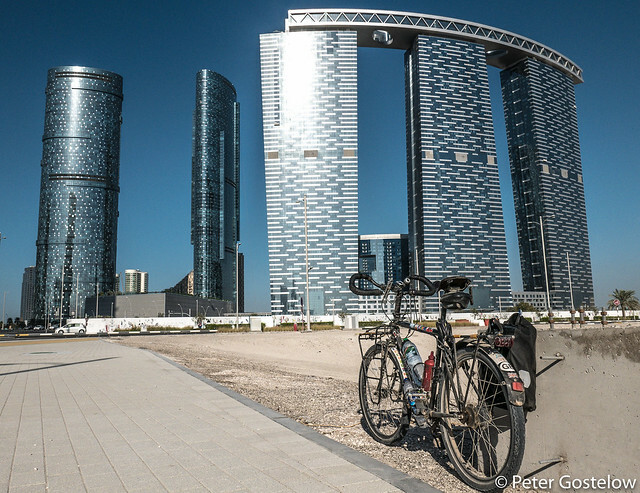 And then a few kilometres later, with bicycle loaded in a 4×4, I was gazing up at the many glass towers of Abu Dhabi. After almost 10,500km since leaving Mwanza in June last year, this was the end of the road, at least for now. The route for this final stretch can be viewed at the bottom of this page . For those who’ve read through the blog posts from the start of this tour, thanks for following along. These days I realise an update and some photos on facebook are likely to be read more than clicking through to a website. I decided to keep a spreadsheet on this particular tour, with some basic stats including distance, accommodation prices, beer consumption (that was going well until I entered Somaliland) that I will put into a forthcoming blog post, along with some reflections on the journey now that it’s over. I’m no longer in one of Abu Dhabi’s glass towers, although my bicycle is. 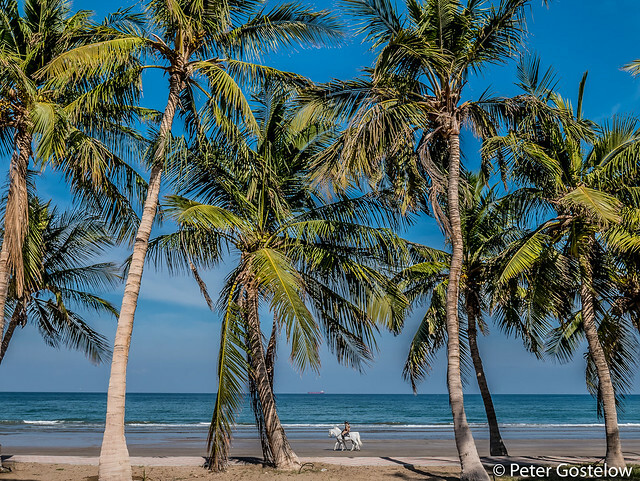 I sit writing this 100 metres from a beach in southern Kenya. It seemed a more fitting place to return to and sort out job prospects (alas not here) than a cold, wet England in February. Perhaps I’ll write a blog post about my time here with a new set of wheels. Isn’t she beautiful. Sad the journey has ended. Eagerly anticipating your next adventure. I just can say it is been amazing and really good inspiration for an ordinary guy like me. When I come accross a map These days, RDC, Morocco, Tajikistan are no longer ordinary, but a challenge to me. Thanks for being somehow our inspiration, and for showing us that is a matter of determination to travel to these places. Im so jealous of your travels. Hope this jealousy turns into action somewhere in the future. You and other bloggers have made me dream again. It’s worth pointing out that Maps.me doesn’t use any special maps of its own, but rather it is based on OpenStreetMap. OSM is often more detailed for cycle tourists than any other map, as there are a lot of mapping anoraks (among which I count myself) who enjoy adding new roads and points of interest to OSM at the end of a long day of touring. While Maps.me is a convenient way to get OSM data on a smartphone, you can load the very same maps on a Garmin GPS. Hi. Thanks for clarifying this. I wasn’t aware of that. Amazing blog post, amazing trip! Really enjoyed following your blog posts, and following since the days of the Crazy Guy on a Bike. A sad state of affairs if Facebook posts will replace your blog. Hard to pinpoint exactly why, but I for one really enjoy your writing — I guess it reads very closely to my way of seeing the world. Well done…keep the blogs coming – great read. I don’t know how small of the minority I am, but I enjoy the blog posts/writing instead of just facebook pictures. Thanks for taking the time to write & looking forward to the next adventure. Hi Peter, Sorry your trip is over. Really enjoyed following you. Great Photos. Actually have been following since the Long Ride Home on CGOAB. 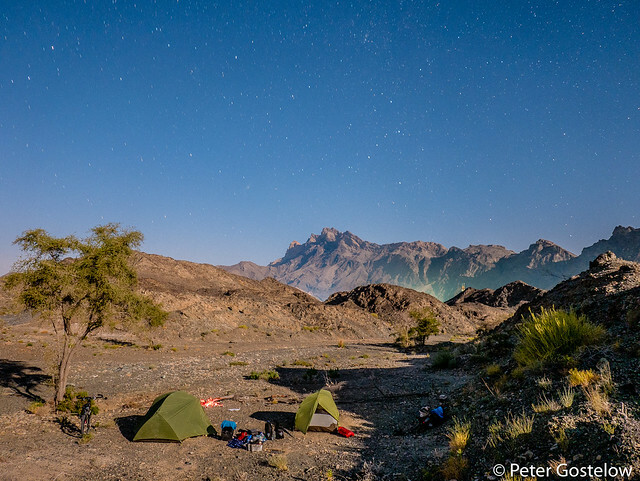 We are off in July to ride the Pamirs and we will also think of the wonderful journal entry of yours when the red pannier was lost….probably not so wonderful for you! Thanks for your continued following. The Pamirs won’t disappoint. I’ll never forget that pannier tumbling down a mountain side into a river! Next for me is another teaching contract. Not 100% sure where yet. What an amazing blog, your experiences are out-of-this world!! thank you so much for sharing, I love it!!! Please keep safe! Glad you’ve enjoyed following along. One more blog post on statistics and reflections from this tour to come. Great history. I’m enjoyed every day of your trip. Thanks for share with all of us!! Thanks for your continued following. Time to get a job now for a while. The road will call me back I’m sure.